Say the name “Moscow”, and it brings forward all kinds of feelings. From cold war, to Olympic Games and down to Napoleon and further back. Here is, in short form, the history of that historical city which will be hosting the 2009 Eurovision Song Contest. The first time the name Moscow appears was when Yuri Dolgoruki, in the west known as “George the First of Russia, in the year 1147, writes to the Prince of Novgorod to urge him to “come to Moscow”. In Moscows first years, it was a small town, but a well placed town close to the river Moscow, from which, legend tells us, it got its name. A wooden wall was built around the city for protection, but that did little good when the Mongoles, in 1238, lead by Kublai Khan, attacked the city. Most of the inhabitants where killed, and the town burned down to the ground. A fate that could have ended the story almost before it began, but not when it came to the Russians. Slowly Moscow recovered, and in 1327, it became the capital of the new state called the Principal of Vladimir – Suzdel. Moscow expanded over the years, and under the rule of Ivan the First, it replaced the city of Tvar as the political centre. The state name was changed to “The Grand Duchy of Moscow", with the doubledheaded eagle as coat of arms, as we also know from present days. The city itself had the knight on horseback killing a dragon as its symbol. It was also Ivan the First that started handing down the crown to his eldest son, creating the chain of rule that lasted to the revolution in 1917. 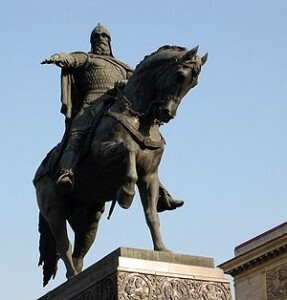 Sick and tired of paying taxes to the Mongolians, Prince Dimitri Dunskoi led the Russians to victory in the battle of Kulikoro in 1380, freeing the greater area of Moscow. But it was first in 1480, a hundred years later, Ivan the Third finally defeated the Mongols and made Russia a free nation. Not only getting rid of them, Ivan also started the creation of the Russia we know today, expanding its borders to all four corners of the mighty country. The threat from foreign invaders was not over though. In 1571, Crimean Tatars invated Russia and almost burned down Moscow, only leaving the heavily fortified area called the Kremlin. Only a few years later, a new war against Poland broke out in the year of 1605. It was a mix-up war because everybody was fighting everybody. The Poles against Russia, and against each other. Sometimes allied with Sweden, and sometimes not. Due to interests, the Swedes from time to time allied herself with the Russians, whom from time to time were fighting each other. Very confusing. But in 1610, after winning at Klushino, Polish forces entered Moscow, and Prince Wladislaus of Poland was briefly elected Tsar. In 1611, the war broke out again and the Poles were driven out of Moscow, and finally out of Russia in 1618. The rest of that century brought nothing else but troubled times to the people of Moscow. The plague that broke out in 1654 and lasted for two years, killed allmost half of the population. The two riots in 1648 and 1662, also brought death and destruction to the city. Both riots were the common people rising against the ruling classes abuse of power and the ecomony going down. However, the biggest threat to “peace” came in 1682 when parts of the army rebelled. The Streltsy regiment, who led the rebelion, wanted the second wife of late Tsar Alexis the First, Sophia Aleksegevna, to be Tsarina of Russia, instead of the son of the first wife, who due to the chain of rulers by birth, was the Crown Prince. There was a lot of killing between the two families, until General Fyodor Shaklovity, took over the loyal part of the army and suppressed the rebelion, and restored law and order in Russia.